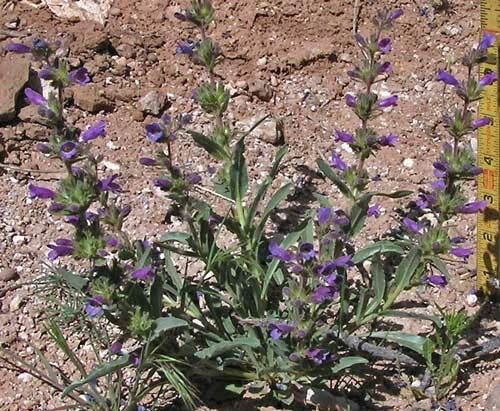 Click to read about Penstemons. 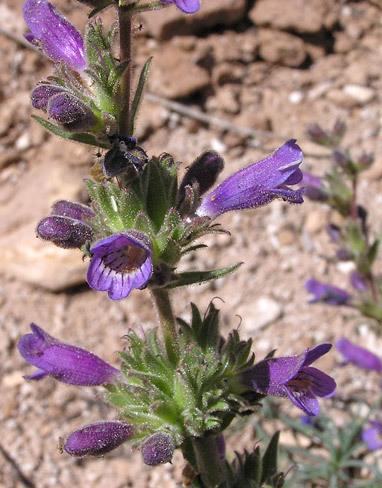 In the top two photographs, Penstemon breviculus glows in early morning light in Canyons of the Ancients National Monument. The third photograph was shot downward from directly above the plant and you can see that flowering stems often bend and sprawl outward. 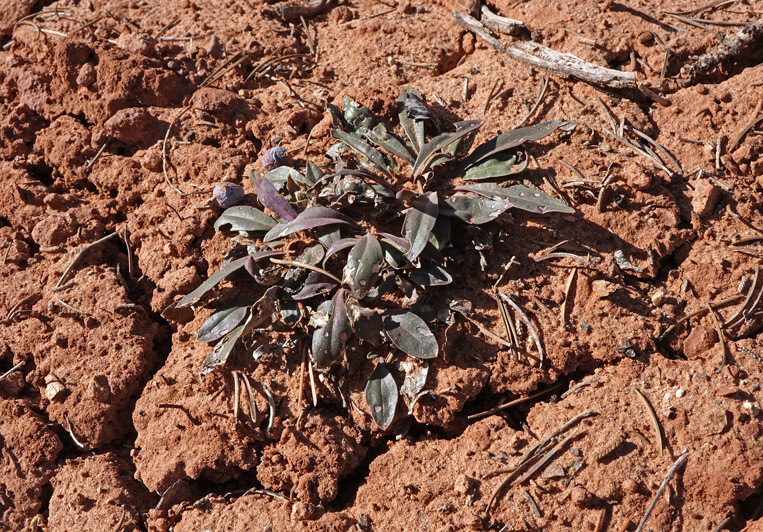 The last photograph above shows a winter plant closely hugging the ground with blue-green leaves having little chlorophyll. Canyons of the Ancients National Monument, May 25, 2010 and Hawkins Preserve, Cortez, Colorado, May 23, 2006. 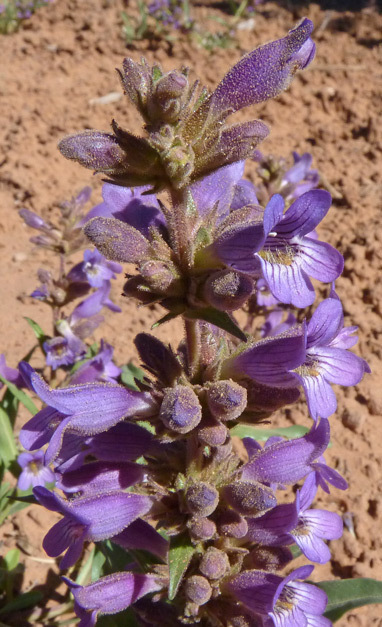 Penstemon breviculus is found in sandy, gravelly, or clay soils of a few counties in southwest Colorado, southeast Utah, northeast Arizona, and northwest New Mexico. 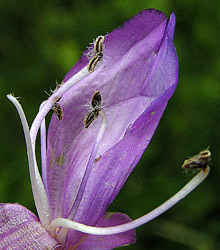 Although this is a rare plant, it is very common, even abundant, in some of these areas. 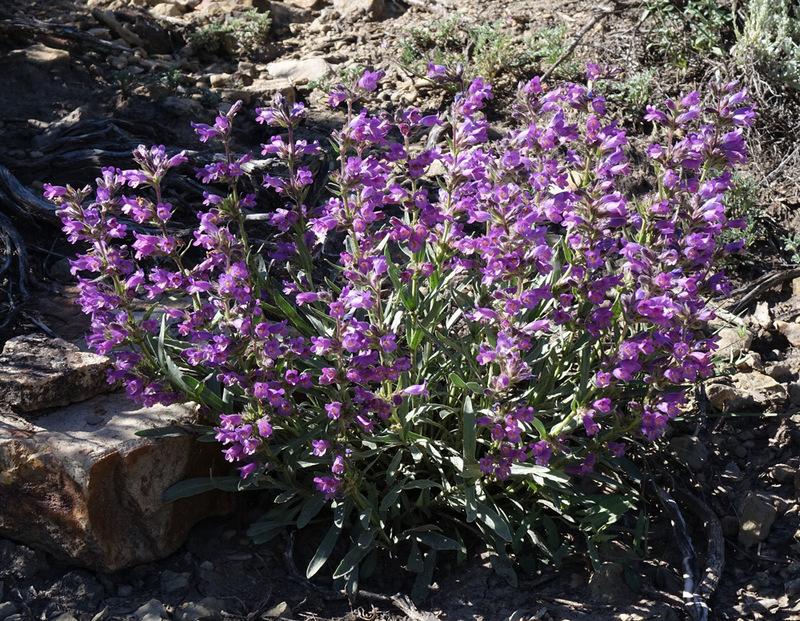 Penstemon breviculus grows to a foot tall with leaves to 3 inches long. 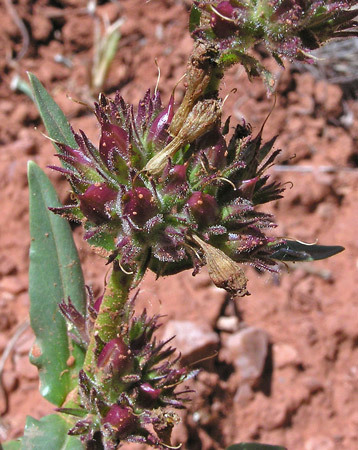 Upper leaves are sessile; lower are petiolate. Lovely lavender-pink to light purple flowers are abundant on multiple stems in each plant. Where you find one plant, look around and you will often find a dozen more. In many of its characteristics, P. breviculus is quite similar to P. ophianthus. Click for a comparison of the two species. 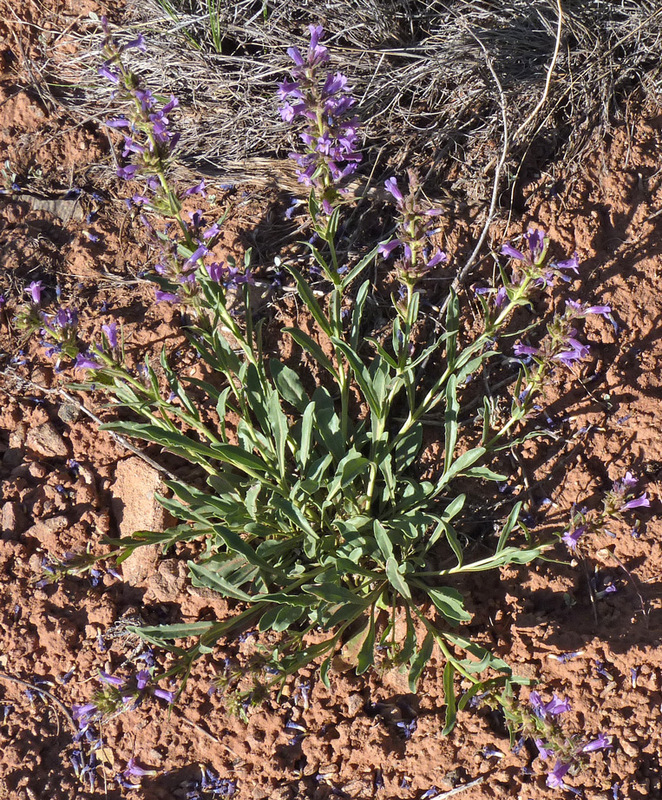 Charles Baker and friends collected the first specimens of this plant near Mancos, Colorado in 1898, and David Keck named the plant Penstemon jamesii in 1938. It was given its present name by Gladys Nisbet and Raymond Jackson in 1960. Latin gives us both "brevi", "short", and "culus", "a little" and together they mean "somewhat short". 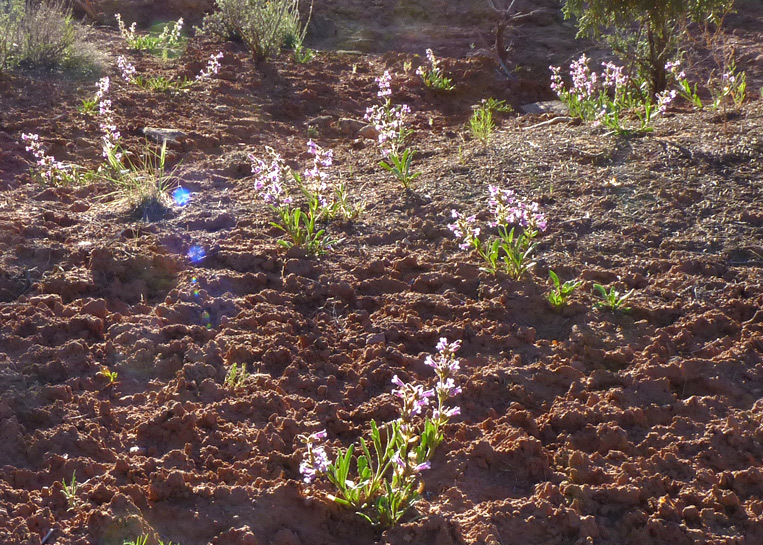 From a few feet away, Penstemon breviculus appears to have a fuzzy halo surrounding its stem and floral parts. As one gets closer to the plant, one sees a glow surrounding these parts. And finally, when one gets very close or uses a hand lens, one can see that the floral tube, the calyx, and the stem are covered in minute, ball-tipped, sticky ("glandular") hairs. Even insects are trapped by the stickiness -- as the third photograph shows. Canyons of the Ancients National Monument, June 7, 2005. 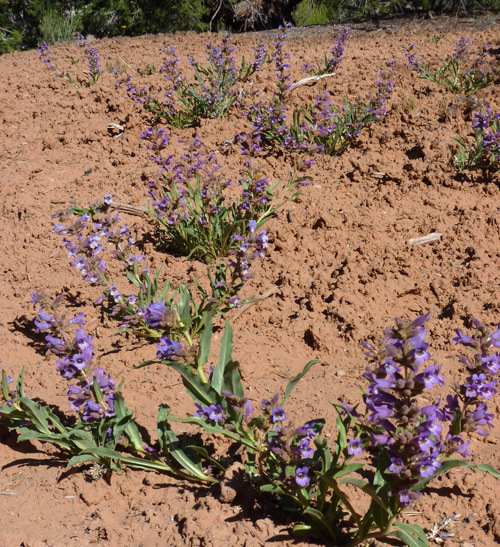 Penstemon stalks must be a tasty treat, for it is common to find them nibbled off. Notice the buff-colored, circular, nibbled stem to the right of center. 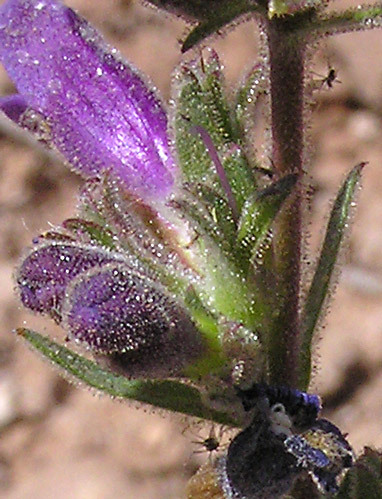 Notice also the grains of sand stuck to the glandular hairs that cover the top parts of the plant. 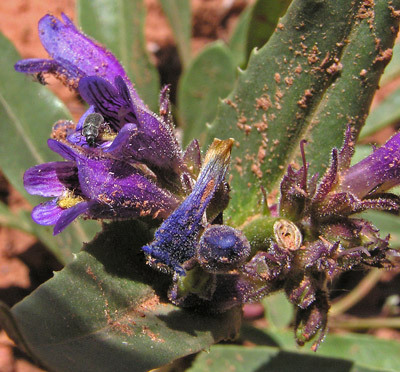 Penstemon breviculus seeds are forming in the purple capsules.